In ten days, world leaders are coming to New York City for a UN summit on the climate crisis. UN Secretary- General Ban Ki--moon is urging governments to support an ambitious global agreement to dramatically reduce global warming pollution. With our future on the line and the whole world watching, we'll take a stand to bend the course of history. We'll take to the streets to demand the world we know is within our reach. Last night, more than 750 people packed into an auditorium just down the street from where the People's Climate March is going to step off, and the energy was electric. It was amazing to see so many new volunteer leaders come together to find out what they can do to make the most of these last 10 days. And honestly, the answer is simple - we're going to make sure that everyone in this city knows about the People's Climate March by blanketing every borough with posters and people talking about the march. Click here to sign up for our most important volunteer day yet and help us spread the word on September 12th to every corner of New York. It's 10 DAYS until the People's Climate March. 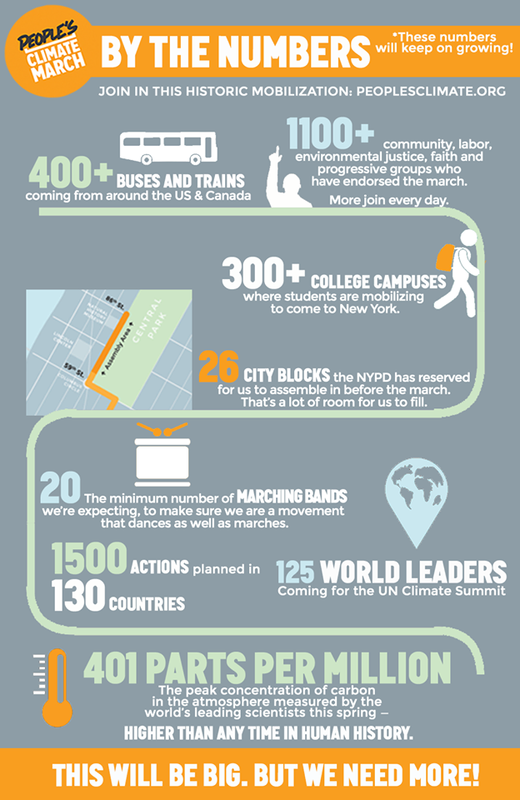 The numbers around this massive mobilization are impressive, but we still need more! 'To change everything we need everyone' isn't just a slogan, it's the truth. Sign up here. 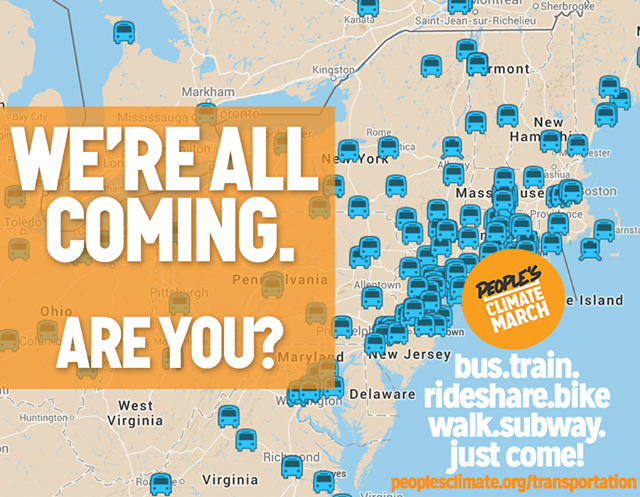 Tomorrow is going to be huge - we're starting in the morning with a subway blitz covering every most of New York's subway stations, raising visibility, and inviting people to join us at the People's Climate March. And in the evening, we're hosting plenty of events -- including our own parade through New York complete with marching band. Click here to join the biggest volunteer day for the People's Climate March yet. Four months ago I walked into a room in New York City with a group of leaders from the environmental justice, climate, and progressive movements, who were dreaming about doing something big around the UN summit on the 23rd. They wanted to send a clear message - it takes everyone to change everything. Last night proves, that with the help of hard working people like you, we are well on our way to making that dream a reality and turning the People's Climate March into a huge moment in the fight against climate change. The energy all across the country has been amazing. More than 1200 organizations have endorsed the march, and more than 400 buses have been organized to bring over 22,000 people from all over to the march -- and those numbers are still growing. Now that we're entering the home stretch, though, it's all about what we do here in the New York metro area - let's kick off these last 10 days in a big way by covering the city tomorrow in People's Climate flyers both on the subways and at fun events all evening. Click here to join the September 12th visibility day. Paul and the People's Climate March Team. P.S. We just launched a massive Thunderclap to make sure the march is visible online as well -- click here to sign up with your Twitter, Facebook, or Tumblr to join a huge simultaneous social media post on September 15th and make sure everyone knows that this is too big to sit out. In September, world leaders are coming to New York City for a UN summit on the climate crisis. UN Secretary- General Ban Ki--moon is urging governments to support an ambitious global agreement to dramatically reduce global warming pollution. With our future on the line and the whole world watching, we'll take a stand to bend the course of history. We'll take to the streets to demand the world we know is within our reach: a world with an economy that works for people and the planet; a world safe from the ravages of climate change; a world with good jobs, clean air and water, and healthy communities. Do you like stats? We have some here. And these are growing every day! We are making this the biggest climate mobilization ever -- and we can make it even bigger. 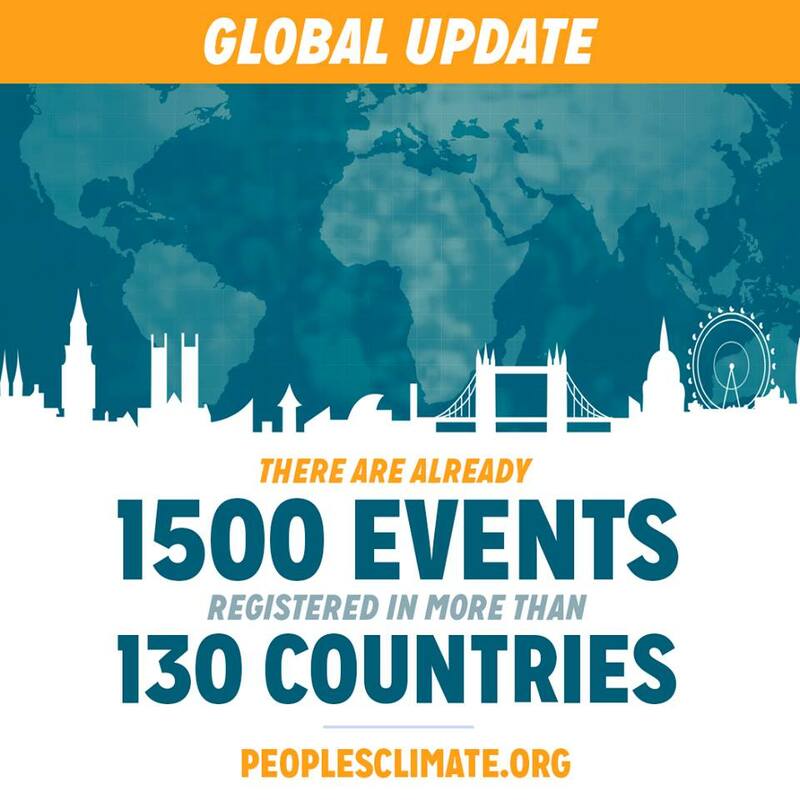 Let's make it huge: if there are no People's Climate Mobilization events where you live, register and host an action here.